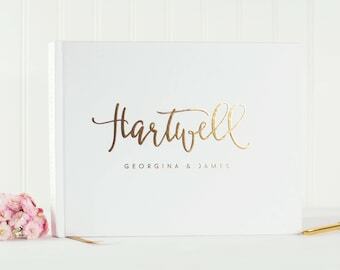 Announcement Wedding Guest Books and Albums, now in 5 sizes and available with Real Foil Printing. 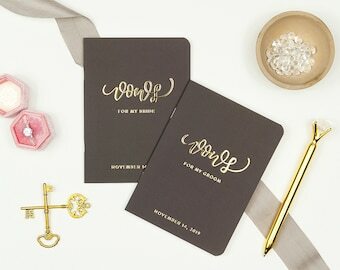 New Wedding Vow Books debuting 2019! 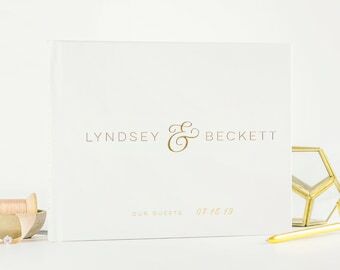 Also carrying foil printed Will You Be My Bridesmaid cards for your Best Day Ever. 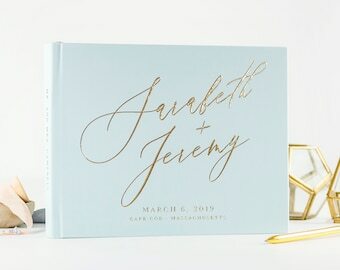 We also carry wedding Invitations, Save the Dates and Custom Address Stamps. Monday - Friday, 9 am - 5 pm EST. Closed weekends & holidays. Most convos are answered within the hour for urgent matters M - F, and the same day if received during business hours for most all other correspondence. If you contact us after hours, please look for a reply the next business day. 1-2 business days from your date of purchase if you have provided us with all your details in the notes to seller or via our online forms. We may be able to accommodate rush orders for an additional fee. Please contact us with your request via email or convo, and be sure to provide a clear timeline for us to help you. We will do our best to accommodate your request and provide cost estimates and timeframes. Please note there may be some periods where we cannot accommodate rush orders due to our workload. 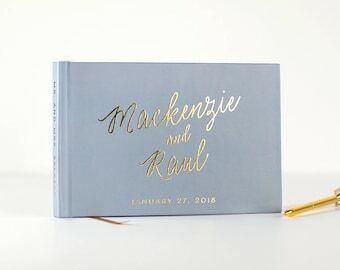 Guest Books are best ordered about 3-6 weeks before your event date for domestic orders, and 6-10 weeks before your date for international orders. 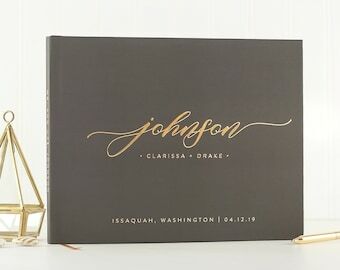 Books take about 2 weeks to proof and print before they are shipped to you (production time is currently at 6-7 business days after proof approval). 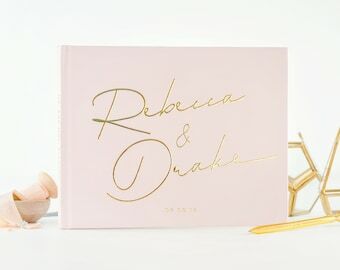 However, we understand the guest book is sometimes the last thing you think of - and we're here to help. Contact us if you need a rush option, and if we can assist, we will. 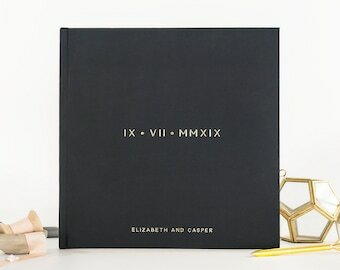 Please note that production and transit times are estimates only; since our process is custom and each book is made to order, there may be some additional days needed for either. 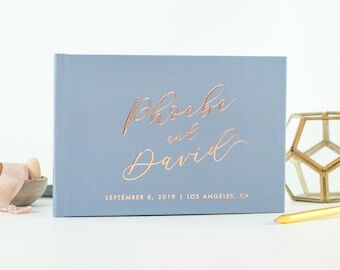 Save the Dates are best sent out anywhere from 6-8 months for a local wedding, to up to 12 months before for a destination wedding. 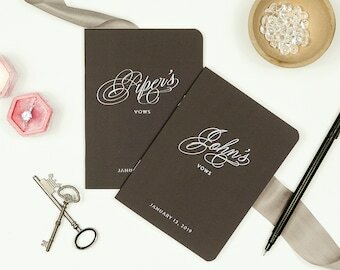 Give your guests enough time to get you on their calendars with today's busy schedules. 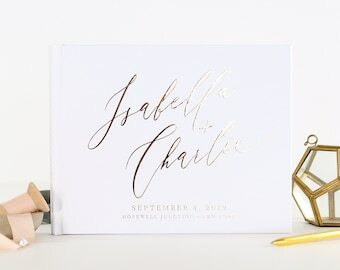 It's generally recommended you order your wedding invitations 4-6 months before your wedding date to have plenty of time to prepare them for mailing. It is not uncommon, if you have all your details finalized, to give yourself 6 months so that you are not rushed. 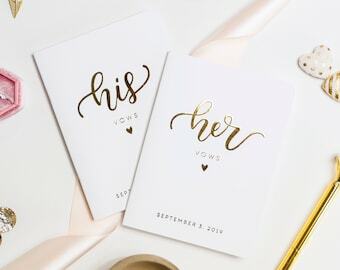 You should set your RSVP date about 4-6 weeks before your wedding to give yourself enough time to finalize your guest list for your vendors and provide an accurate head count for the venue, catering, etc. *All designs contained in our shop are © Starboard Press, LLC with all rights reserved. We vigorously defend our intellectual property through the DMCA process as well as with legal representation. If you choose to unlawfully duplicate our products, you will be subject to legal action. 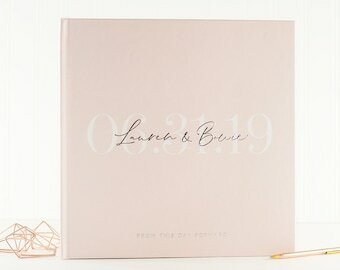 Wedding Guest Books and Albums, now in 5 sizes and available with Real Foil Printing. 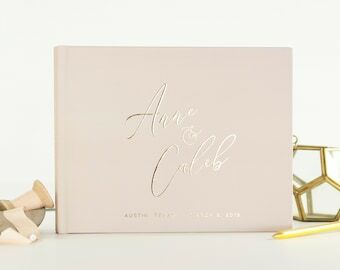 New Wedding Vow Books debuting 2019! 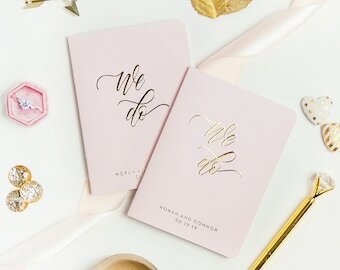 Also carrying foil printed Will You Be My Bridesmaid cards for your Best Day Ever. 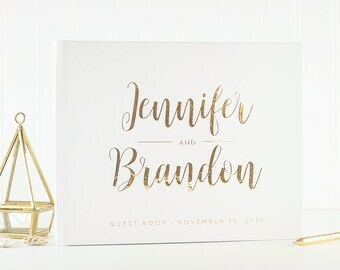 Just received our guest book in the mail for our May 4th wedding and it is beautiful!! I am so impressed with it! 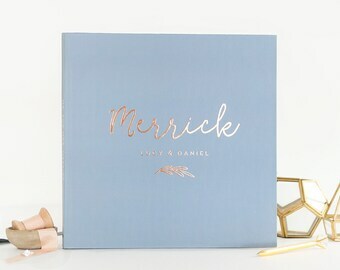 We did #42 for the book color and rose gold foil with a rose gold ribbon. I would post a photo but my phone makes the foil look gold even though it is rose gold. 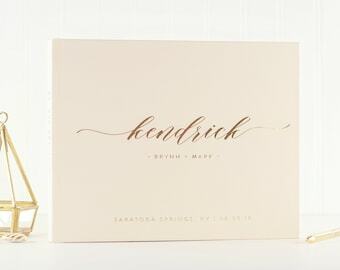 It is absolutely gorgeous and even smelled really good when we opened the package! 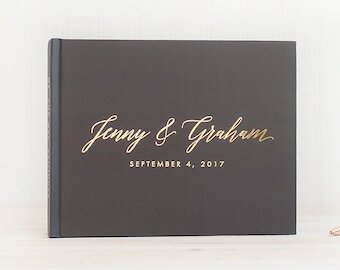 I can't wait to see it on display at our wedding. Love this so much! Thank you! 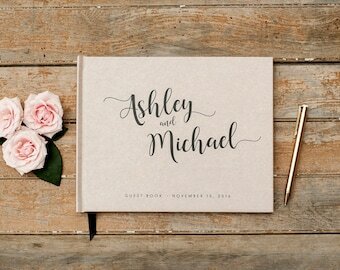 Words can't do justice to how pretty and beautiful this guestbook is! You asked, we heard ya! 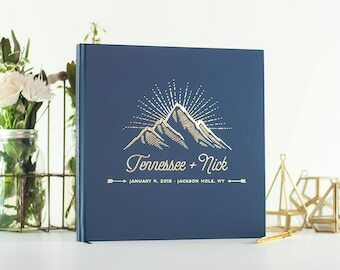 Vow books with personalized names are now available. Sparkle sparkle! 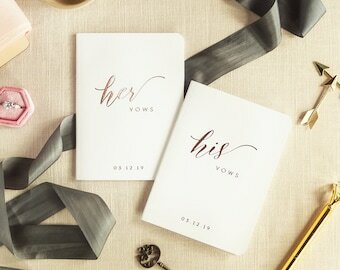 won’t these look elegant when you’re reading your personalized vows during the ceremony? Class on top of class, y’all. Way better than a sticky note. 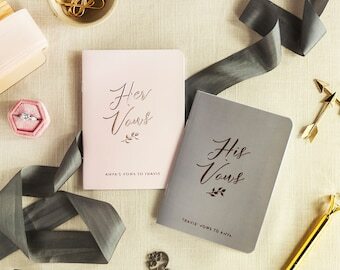 Personalize these with your date, colors, and a quote on the back! 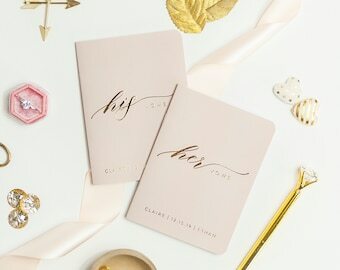 Rose Gold is a beautiful touch. 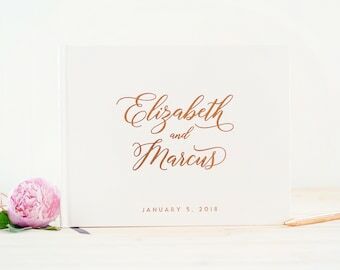 At Starboard Press we specialize in keepsake Guest Books, Albums and Memory Books for your wedding and other important events. 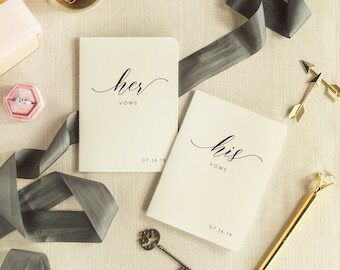 The memories of your wedding day are a crucial part of your personal history. 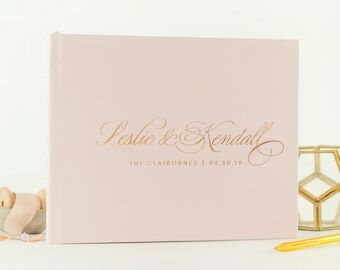 Our hardcover books collect well wishes from your family and friends, and can also double as albums to collect photos and mementos from the big day. 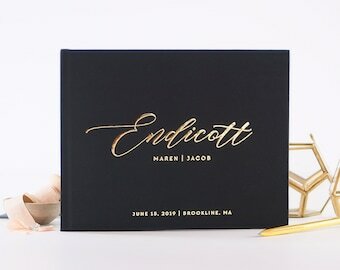 Celebrate your Best Day Ever and your union with a book that offers the finest materials including acid free papers, multiple paper options, and optional real gold foil printing. These books are destined to become keepsakes in your home, to share and look back on for many years. Our ordering process is streamlined to accommodate the personalization of your item in the most efficient, customer-friendly experience. We're always happy to help with questions or concerns, and Julia and Chris will attend to your needs in a professional and personal manner. 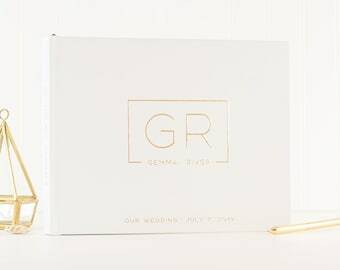 We also carry a selection of foil printed proposal cards for all your wedding attendants. 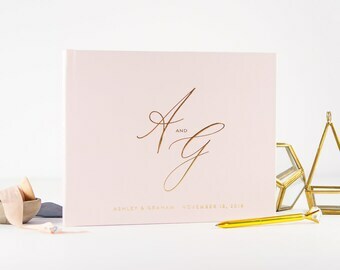 Our "Will You Be My Bridesmaid" collection is ever growing and we currently carry over 20 styles for your bridesmaid, maid of honor, matron of honor and more in authentically stamped gold foil and rose gold foil with a range of classic envelope colors. 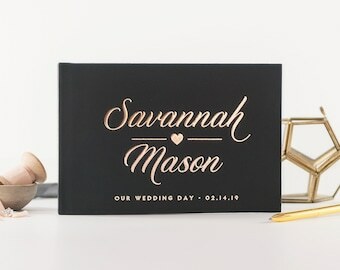 These foil notecards are a great addition to your bridesmaid box. 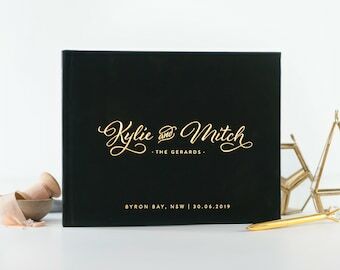 We even have "Thank You for Being My Bridesmaid" and many more "Thank You" styles, so we've got you covered from start to finish. 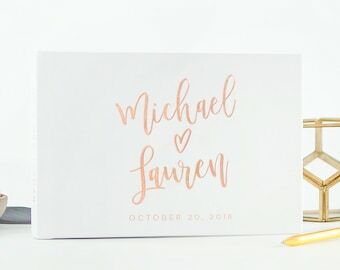 Be sure to check out our wedding invitations, save the dates and announcements, and custom address and wedding favor stamps and view our full website at www.starboardpress.net. Julia & Christopher Roberts are the creative and customer service team. We have been married 14 blissful years. Photo shows us on our wedding day. 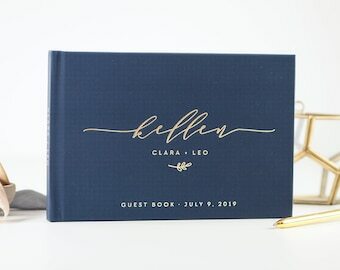 A talented team of individuals takes our guest book and coaster designs and translates them to the finished product, printing and binding each book and printing each coaster to order with environmentally responsible materials. 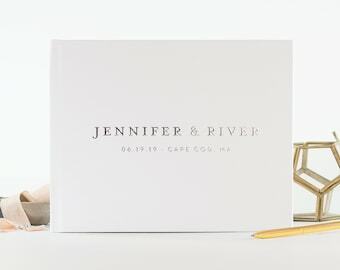 A small close knit bunch of friendly people print our invitations, save the dates, and announcements with a commitment to being environmentally friendly. They are carbon neutral, and utilize wind power and other renewable energy sources. 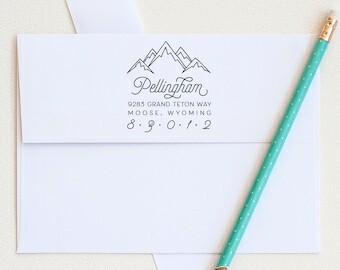 Manufactured in the USA, our laser engraved rubber stamps are made with high quality materials by a caring group of folks who test each one before shipping.